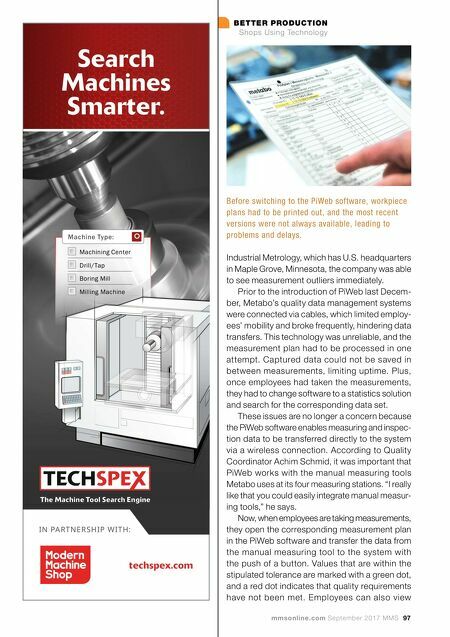 mmsonline.com September 2017 MMS 97 BETTER PRODUCTION Shops Using Technology techspex.com IN PARTNERSHIP WITH: Search Machines Smarter. Machining Center Drill/Tap Boring Mill Milling Machine Machine Type: The Machine Tool Search Engine Industrial Metrology, which has U.S. headquarters in Maple Grove, Minnesota, the company was able to see measurement outliers immediately. 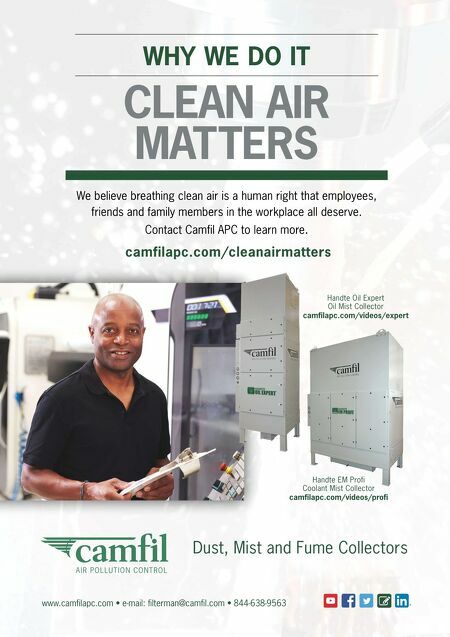 Prior to the introduction of PiWeb last Decem- ber, Metabo's quality data management systems were connected via cables, which limited employ- ees' mobility and broke frequently, hindering data transfers. This technology was unreliable, and the measurement plan had to be processed in one attempt. Captured data could not be saved in between measurements, limiting uptime. Plus, once employees had taken the measurements, they had to change software to a statistics solution and search for the corresponding data set. These issues are no longer a concern because the PiWeb software enables measuring and inspec- tion data to be transferred directly to the system via a wireless connection. According to Quality Coordinator Achim Schmid, it was important that PiWeb works with the manual measuring tools Metabo uses at its four measuring stations. "I really like that you could easily integrate manual measur- ing tools," he says. Now, when employees are taking measurements, they open the corresponding measurement plan in the PiWeb software and transfer the data from the manual measuring tool to the system with the push of a button. Values that are within the stipulated tolerance are marked with a green dot, and a red dot indicates that quality requirements have not been met. Employees can also view Before switching to the PiWeb software, workpiece plans had to be printed out, and the most recent versions were not always available, leading to problems and delays.